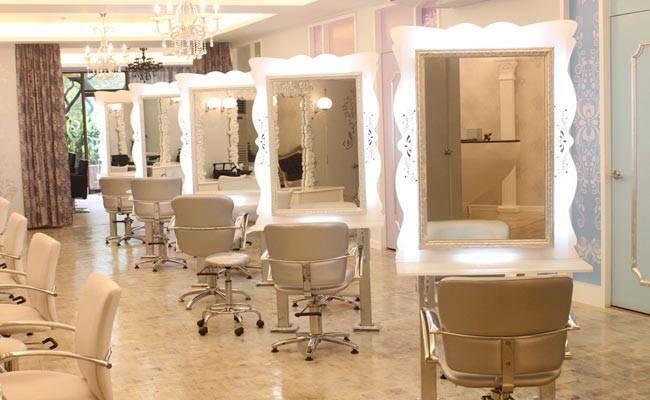 Feel Like A French Princess At This Chic Boutique Salon! Prettify with a back-to-school makeover at this French boudoir-inspired luxury salon and beauty service center. Summer is officially over for all you college chicks, and we have just the thing for you to start the new school year off with a bang. Call up your girlfriends and plan a girls' day out at the posh and luxurious Salon Beauvoir for a day of beauty and pampering that will leave you anxious to show off your new looks at school! Beavoir is the French term for "beautiful view," and as soon as you step inside, you'll see why it's the perfect namesake for the salon. The elegant receiving area features vintage-looking furnishings that will make you feel as if you've been transported to a classy French boudoir, complete with sparkling chandeliers, regal wallpaper, and an elegantly framed velvet couch. The main styling area has the same breathtaking design and is spacious enough for group pampering sessions, so you can bond with the girls while you experience the upscale services! Start by consulting with the creative team of seasoned beauty experts about the look you want to achieve. The staff is composed of world-class, award-winning professional stylists, including creative director and L'Oreal Master Colorist Monette Rivera, senior stylist and men's grooming expert Jojo Rivera, international London-trained stylist Sam Santos, former hair stylist and makeup artist to the Brunei royal family Pam Ferrater, and waxing, nail care, and body expert Susy Cervantes. Once you've decided on the new look you want to achieve, you can sit back and enjoy relaxing French music while you sip on complimentary refreshments and surf the net with the free Wi-Fi. Aside from haircuts, the salon also has a wide range of hair coloring and re-texturizing services, such as color conditioning, foil highlights, perming, shine bonding, and Brazilian blowout. If you want a more subtle transformation, opt for their hair treatments for nixing various hair problems. To complete your beauty day, you and your friends can also try Salon Beauvoir's manicure and pedicure services, as well as their facials and body massages. If you've got a big end-of-summer party coming up, try their airbrush makeup and hair styling beforehand. We recommend booking one of the three VIP rooms for privacy and exclusive use of their iPads! You can even bring your boyfriends along, since there's a men's grooming area at the end of the salon where dudes can revel in the high-class pampering services, too! Launch the gallery to view photos of the luxurious Salon Beauvoir, and go to the next page to see the service menu and price list. Salon Beauvoir is located at Upper G/F, Somerset Olympia, 7912 Makati Ave. cor. Sto. Tomas St., Makati City. The salon is open from Monday to Sunday, 8AM-8PM. To book an appointment, call 904-5154, 478-7670, or 0916-6813722.